Ideal for converting 1/4inches (6.3mm) stereo audio to 2 RCA audio (left & right). Ideal for multipurpose home and audio applications. High Quality Noise Free Performance. Ideal for multi-purpose home- and audio applications. 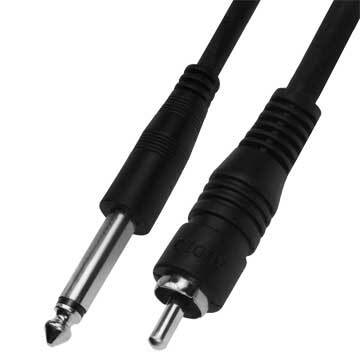 Great for tight spaces that can not accommodate a standard RCA connector. Take a look at our ¼” Audio cables collection which includes Stereo Plug cables and Mono RCA cables. These cables are widely used in professional audio equipment, instruments and home theater systems. We offer highest quality ¼” audio cables with heavy discount on retail price. Such cables come in different sizes. You can buy RCA cables as per your cabling needs. When you purchase our high quality audio cables you also get lifetime warranty. Get our products at the lowest prices on the internet. All our products are RoHS compliant and environment friendly. We work with ISO 9001 - 2000 registered manufacturers to provide highest quality.